Amanita muscaria, a possible source of Soma. Soma (Sanskrit), or Haoma (Avestan), refers to a ritual drink of importance in ancient Vedic and Persian culture. This drink was composed from a plant, most likely hallucinogenic, which caused an overwhelming and empowering feeling of intoxication. This intoxication was perceived to be a quality of the gods, who were also said to consume the beverage for purposes of maintaining their immortality. Both Soma and Haoma are derived from Proto-Indo-Iranian root *sav- (Sanskrit sav-) "to press," referring to the process by which the drink was made (Hindus also referred to the drink as amrita, or "the wine of immortality"). Soma is frequently mentioned in the Rigveda, which contains many hymns praising its energizing and intoxicating qualities. In the Avesta scripture of Zoroastrianism, Haoma has an entire Yasht (hymn) dedicated to it. In each tradition, the drink is identified with the plant, personified as a divinity, and celebrated in myth. Though the use of Soma declined in importance in Hinduism, and its specific identity was lost, at one time it was a central element in Vedic ritual practice. Today, scholars are unsure of the exact identity of Soma and propose several possible candidates for the plant (see below). Soma is praised in 120 hymns within the Rg Veda, rendering it one of the most recognized entities in that text. For example, the entirety of the Ninth Mandala of the Rigveda, also known as the Soma Mandala consists of hymns addressed to Soma Pavamana (or "purified soma"). Soma was considered to be the most precious liquid in the universe, and therefore was an indispensible aspect of all Vedic rituals, used in sacrifices to all gods, particularly Indra, the warrior god. Supposedly, gods consumed the beverage in order to sustain their immortality. In this aspect, soma is similar to the Greek ambrosia (cognate to amrita) because it was what the gods drank and what helped make them deities. Indra and Agni (the divine representation of fire) are portrayed as consuming soma in copious quantities. Therefore, soma bridged the gap between human beings and gods. Soma was guarded and distributed by the Gandharvas, part-man, part-animal nature spirits who have superb musical skills and act as messengers between humanity and the gods. During the performance of the Vedic sacrifices, soma was prepared by a priest who used stones in order to press juice from the stalks of an indeterminate mountain plant (which has been hypothesized to be a psychedelic mushroom, cannabis, peganum harmala, or ephedra; see below). The stalks were pounded between these stones within the sacrificial area. Such pounding created what Vedic seers called tapas (literally "heat," later referring to "spiritual excitement" in particular). The juice produced was then purified by the presiding priest by filtering it through sheep's wool and collecting it in tubs. The resulting extract, a sweet brown liquid, was then mixed with other ingredients such as beer, milk, water, curds, ghee, barley and/or honey and then offered to the gods. The remainder was consumed by humans from special cups. Three pressings were undertaken each day of the sacrifice. Due to the supposedly supernatural powers bestowed upon those who drank it, soma gradually came to be portrayed as a god (or deva). However, unlike other gods, soma had few anthropomorphic characteristics, commonly portrayed in Vedic art as a bull or bird, and sometimes as an embryo, but rarely as an adult human. Soma is also described in terms of the effect of the beverage upon those who consumed it. The god, the drink and the plant probably referred to the same entity; at the very least differentiation between the three was ambiguous. Soma's divine dominion was held over plant life. As well, several texts like the Atharva Veda extol the medicinal properties of Soma, and he was regarded as the king of medicinal herbs. Hence, he was given the alternative title Oshadhi-pati, or "supervisor of herbs." Despite his connection to the earth, he was seen as having originated in the heavens. In the later Vedas, the god Soma had evolved into a lunar deity and was identified with the moon god Chandra, and came to be symbolized by a silver crescent. Mythology explains that Soma was married to Rohini with whom he created a son. Apart from Rohini, Soma had 27 other wives who were daughters of Daksha, the ancient creator god. Based on complaints submitted by his daughters, Daksha felt Soma paid too much attention to Rohini. Daksha cursed him to wither and die with leprosy, but the wives took pity upon Soma's fate and intervened, claiming the punishment to be too severe. Daksha could not take back the curse, but instead revised it so that Soma's death became periodic and temporary, and is perpetually acted out over and over again by the waxing and waning of the moon each month. Alternatively, the waning of the moon is said to be caused by the various god's consumption of soma, with the moon serving as the cup from which they drink it. A waxing moon meant Soma was recreating himself, ready to be consumed again. Zoroastrianism adopted many aspects of the surrounding Indo-Aryan religious traditions as it developed through history. Haoma, the deity and the beverage, can be identified as an example of this syncretistic trend based upon its similarity with Soma. The importance of Haoma in Zoroastrianism is evidenced within the Avesta (particularly in the Hōm Yast, Yasna 9.11). The plant Haoma yielded the essential ingredient for the ritual drink, parahaoma, and, as in Hinduism, it is portrayed as a personification of the divine. In the Hōm yašt, the Yazata (divine) Haoma is said to have appeared to the prophet Zoroaster "at the time of pressing" (havani ratu) in the form of a beautiful man. Yasna 9.1 and 9.2 exhort him to gather and press Haoma plants. Like the Vedic beverage soma, Iranian haoma allows one temporary immortality through intoxication. In Yasna 9.22, it is told that Haoma grants "speed and strength to warriors, excellent and righteous sons to those giving birth, spiritual power and knowledge to those who apply themselves to the study of the nasks." Haoma also came to be perceived as its divine priest. In Yasna 9.26, the supreme deity Ahura Mazda is said to have invested him with the sacred girdle, and in Yasna 10.89, to have installed Haoma as the "swiftly sacrificing zaotar" (Sanskrit hotar) for himself and the Amesha Spenta. Haoma services were celebrated until the 1960s in a strongly conservative village near Yazd. Haoma the beverage still plays a major role in the ceremony of Yasna, the paramount Zoroastrian liturgy. This ritual involves the sacrifice of haoma in front of a fire. The ceremony is prefaced by the Paraga, a prepatory rite, where a number of ritual movements leads to the preparation of the haoma beverage, which consists of consecrated water, pomegranites, goat's milk and twigs. This mixture is poured into a special well outside the building where the sacrifice is undertaken so that it may render its strengthening abilities upon all of creation. Thus, haoma fulfills the purpose of the Yasna, to purify the world by bridging the gap between the sacred and profane worlds so that they might come into union. The plant from which soma was extracted is not explicitly stated in the early Vedas, thus, there has been much speculation in academic circles as to what the original Proto-Indo-Iranian Sauma plant actually was. Some clues as to the characteristics and location of the plant are provided within the Vedas. The Rigveda associates the Sushoma, Arjikiya and other regions with Soma (e.g. verses 8.7.29; 8.64.10-11). Sharyanavat was possibly the name of a pond or lake on the banks of which Soma could be found. The plant is described as growing in the mountains (giristha, cf. Orestes), yellow or tawny in color with long stalks. Because it grew far away in the mountains, Soma had to be purchased from traveling traders. The plant supposedly grew in the Hindukush Mountains and thus it had to be imported to the Punjab region. The ayurvedic scholar Susruta wrote that the best Soma is found in the upper Indus and Kashmir region (Susruta Samhita: 537-538, SS.CS. 29.28-31). Through the centuries, knowledge of the plant was lost altogether, and Indian ritual reflects this, such as in expiatory prayers which provide apologies to the gods for the use of a substitute plant (e.g. rhubarb) due to the unavailability of Soma. By the time of the Brahmanas (800 B.C.E. ), additional substitutes for the plant mentioned in the Vedas had been mentioned, including varieties of creepers, grasses, and flowers. Since the eighteenth century, Western scholars have attempted to identify the original soma plant. Soma was generally assumed to be hallucinogenic, based upon the passage from Rg Veda VIII cited above which speaks of feelings of immortality and expanded god-like consciousness. 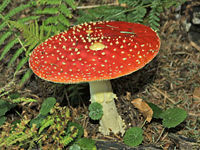 For this reason, such hallucinogens as the mushroom amanita muscaria, have been considered possible candidates for Soma. However, Rg Veda VIII is the only evidence of hallucinogenic properties within the entire book full of hymns to Soma. The typical description of Soma is associated with excitation, tapas as well as the warrior-god Indra, and appears to have been consumed by Aryans before entering into battle. For these reasons, energizing plants have also been considered alongside hallucinogens as possible candidates for soma. This could be a possible explanation for the deity Soma's frequent association with medicine. Since the late 1700s, when Anquetil-Duperron and others made portions of the Avesta available to western scholarship, several scholars have sought a representative botanical equivalent of the haoma as described in the texts and as used in living Zoroastrian practice. Most of the proposals concentrated on either linguistic evidence or comparative pharmacology, or else simply focused upon ritual use. Rarely were all three considered together, which commonly made for tenuous theories as to the identity of the plant. In the late nineteenth century, the highly conservative Zoroastrians of Yazd (Iran) were found to use Ephedra (genus Ephedra), which was locally known as hum or homa. These Zoroastrians frequently exported Ephedra to the Indian Zoroastrians. The plant requires a cool and dry climate, and therefore does not grow in hot and humid India, though it does thrive in central Asia. Later, it was discovered that a number of Iranian languages and Persian dialects use hom or similar terms to refer to local varieties of Ephedra. Considered together, the linguistic and ritual evidence appear to establish that haoma was some variant of Ephedra. Bakels, C. C. 2003. “The contents of ceramic vessels in the Bactria-Margiana Archaeological Complex, Turkmenistan.” Electronic Journal of Vedic Studies 9 (1c). McDonald, A. "A botanical perspective on the identity of soma (Nelumbo nucifera Gaertn.) based on scriptural and iconographic records." Economic Botany 58: S147-S173, 2004. Nyberg, Harri. The problem of the Aryans and the Soma: The botanical evidence in The Indo-Aryans of Ancient South Asia. Edited by G. Erdosy. Ossining, NY: Walter de Gruyter, 1995. pp. 382-406. Parpola, Asko. The problem of the Aryans and the Soma: Textual-linguistic and archaeological evidence in The Indo-Aryans of Ancient South Asia. Edited by G. Erdosy. Ossining, NY: Walter de Gruyter, 1995. pp. 353-381. "Secrets of the Dead: Day of the Zulu.” New York: Thirteen/WNET. Educational Broadcasting Corporation, 2002. Bhishagratna, Kungalal (trans.). Susruta Samhita. Varanasi: Chowkhama Sanksrit Series, 1981. Swami Rama. Living with the Himalayan Masters. The Himalayan Institute Press, 1978. All links retrieved October 11, 2015.